The first is the Lornier dress - a long sleeved gown with a geometic pattern silk skirt (it is one single piece). The arms on this dress are very thin so size up if you love it -- it is on a GREAT sale right now online (77% off!). If you prefer two pieces you can mix and match with this skirt. I wore this to our USC graduation at the California Club. It was classy and sophisticated and perfect for a formal work event. The second dress is the Abu Dabi dress in pink. This dress is light pink ombre and the skirt has tiny pleats that are so fun! 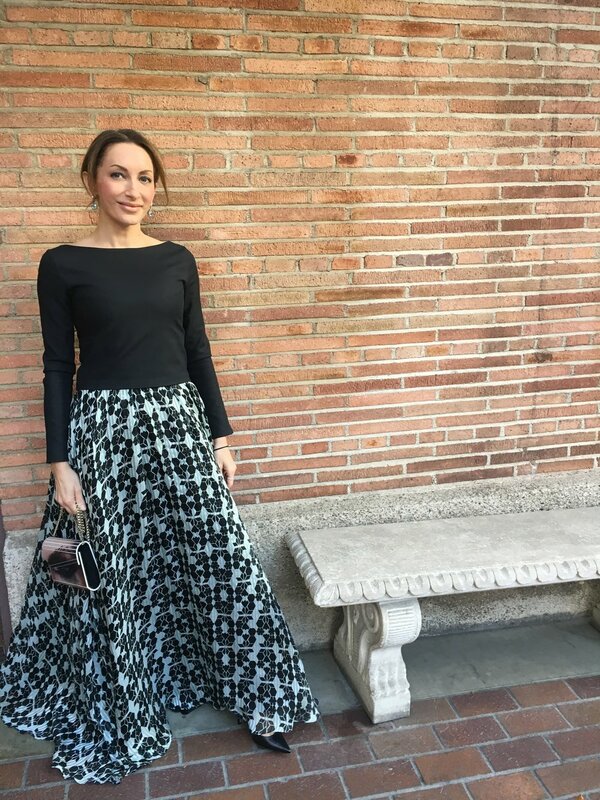 I wore this pretty number for a summer wedding in South Pasadena. I love long dresses for summer weddings, and I also like that even though this is silk it can be dressed up for an event or dressed down with sandals and less jewelry. I played up the pink with rose gold jewelry including these gorgeous Laine Olivio bezel set diamond bands that I have been wearing every day. They add so much sparkle to everything. Sadly, this dress is no longer available online but check out Negarin and Laine Olivio. I hope you love them both as much as I do!